Business owners must constantly be vigilant against theft, and the most common type of theft is by employees and trusted financial advisers. 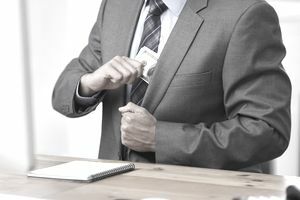 In this article, learn some signs that an employee is embezzling and some tips for protecting your business from employee theft and embezzlement. Embezzlement is theft or malfeasance (bad actions) by employees or trusted others in a business. Most embezzlement involves the theft or diversion of company funds to the employee. Embezzlement can happen in any part of the company, but it's most common in departments where money, cash, checks, or credit cards are processed (like payroll or accounting). It can also happen where products or supplies are processed, as in shipping, inventory, and the office supply cabinet. Fraud is a general category that includes both embezzlement and theft. According to a 2012 report from the Association of Certified Fraud Examiners (ACFE), "the typical U.S. business loses 7% of its annual revenues to employee fraud" and small businesses have the most cases and the highest losses." ACFE says that most employees who commit fraud or embezzlement exhibit tell-tale signs like living beyond their means, having financial difficulties, having unusually close relationships with vendors, and having excessive control issues. If you are alert and vigilant, you may be able to detect and prevent these business losses. Employees who have close relationships with vendors. Rapidly disappearing office supplies. If it seems you are spending more and more on office items, they may be going home with employees. Personal relationships between employees and other employees, vendors, or customers. Being aware of the signs can help you know where to focus your investigations. One of the best ways to prevent theft and embezzlement is to manage employee behaviors. In the list above there are several behaviors that you can curb. Set up specific policies in your employee policies and procedures manual to cover these situations. Require employees to take a vacation. Don't let them accumulate too much vacation. Limit overtime for employees who work in sensitive areas like payroll. If the employees are salaried, require them to stop working at a specific hour. Never allow employees to take work home. While good working relationships with vendors are helpful to your business, keep an eye on those relationships. Keep an eye out for employees who often lunch with vendors or who are related outside contractors who do work for your business. Set up policies to separate out employees who have personal relationships with other employees (called fraternization policies). Deposit daily and reconcile monthly. Leaving cash sitting around is too tempting for some employees, and reconciling the bank statement each month helps you catch irregularities sooner rather than later. Separate financial duties of employees. For example, the employee who writes the checks should not be the employee who reconciles the bank statement. Keep track of petty cash. The money in a cash drawer can prove too tempting for some employees. Require that all petty cash transactions have a petty cash slip or log to support them, and require two signatures on petty cash refill checks. MBWA (Manage by Walking Around). Let employees know you are keeping an eye on things around the company. Don't get into employee lockers or desks or personal items, just be watchful for changes or unusual activity. It's surprising how people will toe the line when they know someone cares enough to watch. Check to make sure that travel expenses are supported by appropriate paperwork and that they are in line. For example, check hotel bills to make sure you aren't paying for movies or massages. From the first day of work, employees should know that you require them, to be honest. A new employee will conveniently forget what you tell them, but if they must read and sign an employee handbook or policies and procedure manual, they don't have the excuse of not knowing what's required. Keep your employee handbook updated and include information on your expectations and what will happen if they aren't honest. Law enforcement types will tell you that the biggest deterrent to crime is the likelihood of being caught and prosecuted. Catching employees stealing or embezzling isn't enough; you must be prepared to prosecute. Being lenient because an employee "only did it because she needed the money" isn't going to keep her or others from stealing from your business. Before something happens, spend some time talking with an employment attorney, someone who is familiar with employment laws and how to deal with employee issues. Find out your rights as an employer, how to deal with suspected theft or embezzlement, how to communicate about this issue with the press and other employees, and how to prosecute an employee. If you suspect an employee is stealing from you or embezzling, your first call should be to an attorney, but it's much better if you have a relationship with someone and you know the general outlines of dealing with employee theft and embezzlement. Disclaimer The information in this article and on this guide site is for general information purposes and is not intended to be legal or tax advice. Every situation is different; before you take any action against an employee, consult an attorney.